Notary Public services have always been crucial to government, commerce, and private life. For centuries Notaries Public have been serving as neutral witnesses to some of our country’s most important transactions. Even today, Notaries are highly-regulated and held to a strict standard in order to protect the public from fraud and ensure the fairness and legitimacy of many daily transactions. Here is a look at how Notary Public services have changed over time and where the industry is heading. Notary services go as far back as ancient Roman times. Since very few people knew how to read or write, public officials appointed a notary or “notarius” to draw up wills and documents of agreement and store them for safekeeping. Notary seals consisted of wax seals containing symbols or engravings. These seals were the precursor for the notary seal we have today. In early colonial times here in America, public notaries were considered to be of high moral character and were appointed to certify documents and keep them safe. The contributions of notaries to colonial life and our nation’s founding and development are considered to be one of the reasons business in America became a big success. As trusted and objective third parties, notaries were important to transatlantic commerce and were depended on by both parties to honestly report loss or damage to a ship’s cargo. While held in high regard, it was a tumultuous time, and some notaries were even killed for authenticating documents between those fighting for control of the New World. Thankfully, this is no longer the case! More recently, Notary Public services were typically found on staff in offices that needed regular Notary Public services like the city or town’s clerk’s office, banks, law offices, and real estate offices. Mobile notary services have been especially helpful for the medical community since medical providers are often asked for notarized affidavits pertaining to medical records or related documents. Also, individuals who are unable to travel due to a medical condition benefit greatly from mobile notary services for power of attorney, medical directives, or other important documents. Check out our Ultimate Guide to Notary Public Services in Nevada to learn more about the importance of notarization, what types of documents need to be notarized, and what to look for when searching for a Notary Public. Here in Nevada, Assembly Bill 413 was passed in 2017 establishing provisions relating to electronic notarization. The law went into effect July 1, 2018. Nevada has adopted temporary regulations in regards to requirements for electronic and remote notarizations, but the discussion over virtual signings and the integrity of the remote notarization process continues here and in many other states. Currently, there is a law presented at Nevada Legislature that will allow virtual signings. This will likely be subject to much debate. When searching for the best Notary Public services, be sure to look for a Notary Public that is certified by the State of Nevada, is a member of the National Notary Association, and is able to work with your schedule so you can meet needed deadlines. Fingerprinting Express provides professional, hassle-free Notary Public services for all of your important document transactions. 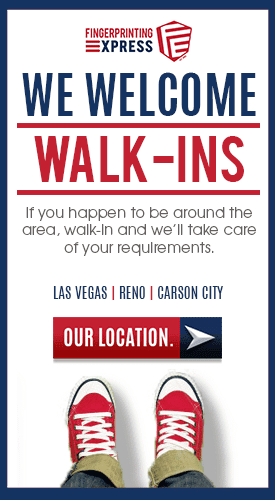 You can walk into any of our four locations at your convenience or schedule an appointment during our normal business hours. We also offer mobile notary services! Give us a call at 1-800-919-0227 to book a time with a traveling notary. Feel free to contact us with any questions about the process or what you will need to bring to have your document notarized. At Fingerprinting Express we strive to provide the most professional and timely service in the industry. We have a Notary Public at all locations during store hours and we’re open during lunch. In addition, if you need a Notary Public mobile service in Nevada, call us at 1-800-919-0227 to schedule your service today.